It was my turn to DJ our six-woman dance circle last month. 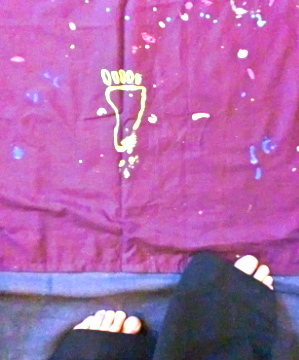 When I arrived at the Dancemakers studio, I put a king-size purple sheet on the floor near the windows. 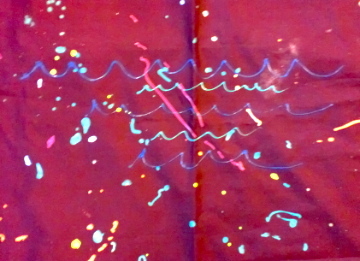 The sheet became our canvas for the session’s theme: Dancing in Quiet Gratitude. 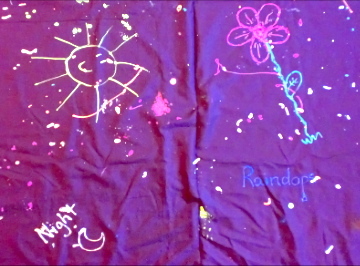 I invited my fellow dancers to decorate the purple sheet in response to the theme of gratitude. 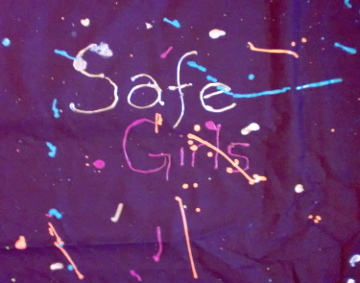 I had some fabric markers, but the small bottles of neon fabric paint proved more popular. The four of us filled the sheet with these words and images: rivers, voice, movement, bosoms, silliness, mistakes, great-grandmothers, grandmothers, mothers, daughters, safe girls, spirit, breath, the forest, laughter, rocks, fierce winds, night, moon, kindness, creativity sheets, raindrops, flowers, hope, fire, goldfinches, fierce goddess, play, community, beauty, thunder, food, wild grasses, health, smiles, art, ocean, a tomato, You, a foot, refreshing tears, music, and lightning. Over the course of the two-hour music set, the purple sheet’s function evolved in a wonderful way. At the beginning, it operated like a picnic blanket on which to gather and discuss the theme of the session. When the music began, the sheet was a connecting fabric; all of us were lying on the floor with some part of us touching the sheet, whether it was only a head or an entire body curled up on it. 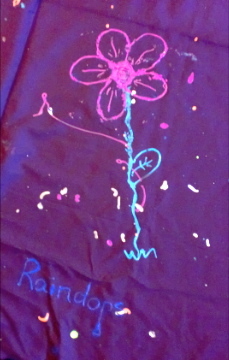 As the dance progressed, we crouched at the edges of the purple canvas each time we felt inspired to write or draw. Then we moved in to fill the centre as we moved more deeply into the set. 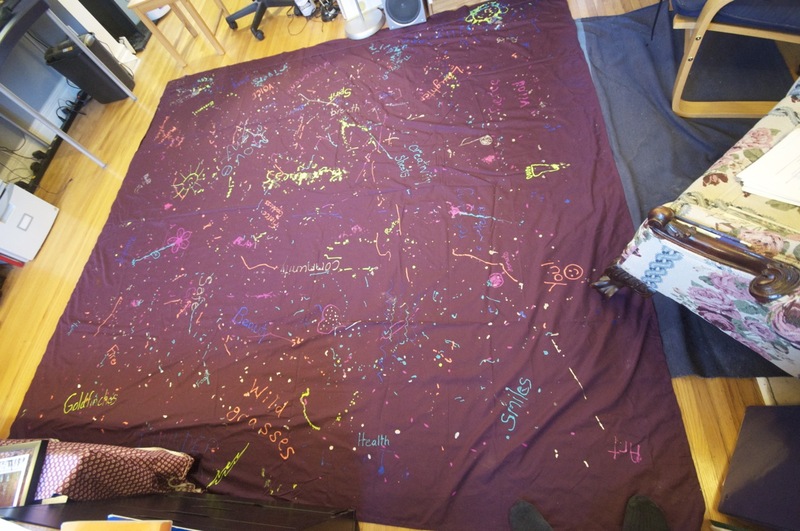 And towards the end of our time in the studio, I started squirting fabric paint at random, and soon we were all squeezing the bottles and giggling as blobs of paint rained down on the sheet without constraint. 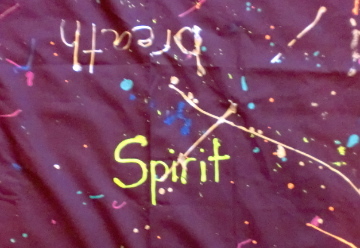 While we were collaborating on our modern art experiment, Brett Dennen was singing “Blessed is this life, and I’m going to celebrate being alive.” I felt that we honored the spirit of his words with our ecstatic paint-dance. When the music ended, we were back in a circle, gathered around the no-longer blank sheet. 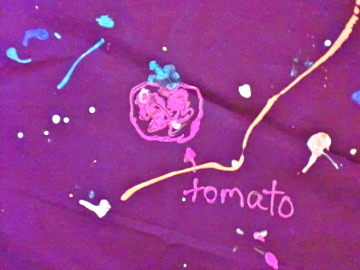 Each of us talked about what images caught our fancy (it was the tomato for me!). 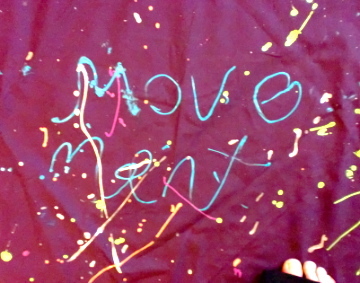 Then we ceremoniously folded up the sheet, even though I realized to my dismay that the fabric paint was still wet. After I got home that night, I had to peel the sheet apart! There were plenty of smears and blobs, but luckily most of the words and pictures remained clear. I hope you enjoy looking at the Purple Gratitude Sheet as much as we enjoyed making it! I still LOVE the purple gratitude sheet! Hooray! I’m so glad you love the even-more smudged version of the purple gratitude sheet. I’m sorry I’ll miss your set next week, but look forward to hearing how awesome it was! How wonderful to have a record of the gratitude sheet! Thanks again for facilitating such a beautiful, fun and transformative experience, Catherine. 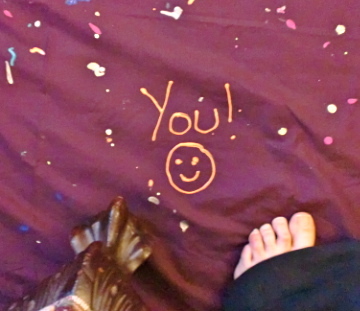 Your purple gratitude sheet fills me with giggly, girlish delight. I wanna squirt paint on it too! What an amazing night of connection and fun. I’m so happy the purple gratitude sheet delights you! Your delight is delightful! Thank you, Brenda. And I’m so glad you were there that evening. I love your word “transformative” and I’d love to learn more about your experience of transformation by e-mail on in person some time. Helps me with my own transformation. oh i just love love love this!!! i love the smudge… makes it that much better! what a fun dance… and amazing creativity… yes… certainly gratitude!!! Yay! It makes me happy that you love the smudges! It is like a purple sky! Thank you, Noreia star!